Check out the latest news, podcasts, and other media content featuring Lidwell Writing Services, LLC. In this episode, Dawn Lidwell, Founder & CEO of Lidwell Writing Services, LLC shares her story, insight, and knowledge on why show notes are critical to a successful podcast, what she believes is the 'true' purpose of a show note, and the difference between short-form and long-form show notes. Dawn Lidwell joins Jo Dodds to share how outsourcing helps her get things done in her business as she overcomes the challenges of working from home. She discusses the significance of letting go of control as you create a team and expand your business as well as the benefits of working with a team from a different timezone. She also shares the resources she uses to manage her tasks and why staying mentally sharp and focused allows her to have the power to live more. 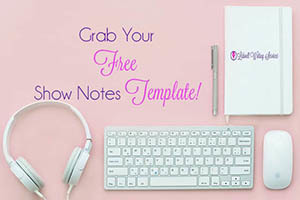 Dawn Lidwell explains the difference between podcast show notes and transcriptions, how her company initially started, and why she is passionate about helping businesses and brands share their message with the world by delivering outstanding show notes service. She also shares some of her fondest childhood memories and why she believes holding onto your passion and staying committed, persistent, and determined is the key to achieving your goals and dreams.